Now that we’ve owned our own place for over a year now, it’s finally at the point where we’ve got each room looking as we want it to. We’ve added storage so that out stuff doesn’t look like it just exploded everywhere and generally everything is where it should be. Bar a few pictures and other decorative stuff, we are pretty much done. The spare room / my study was the last room to get the makeover treatment. For the longest time it was merely a repository for all the stuff that had been displaced because we were trying to sort out other rooms. 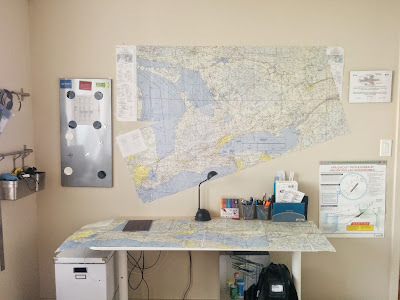 Now it is finished and I am very pleased to say that it has an entire space dedicated to flying and flight planning. This is where LFE is plotting the takeover of the known universe Southern Ontario. I think you need a Picture of JES on that wall.